Molift Smart 150 Folding hoist is the easiest, lightest, usable hoist on the market. Lifts a max. of 24 Stone or 150Kg off the floor, goes through 75cm doors easily, weighs only 25Kg with battery and 24kg minus battery, separates into 2 pieces easily and comes with a battery and charger. The Managing Director is a full-time wheelchair user and states "The Molift Smart 150 is a product that's not just a disabled aid, it's a family friend. Why? Whether you want to travel away from home for the night or under take a world tour,the Molift Smart 150 will make it happen. Those of us that need assistance in to bed, floor to chair if we have a fall or access the toilet as there is no shower chair, need the Molift Smart 150 as it not only give's you peace of mind, it give's you an easier life. Whether it's camping with friends and family, cruising holidays or just a break away, The Molift Smart will help your carers or family members to also have a break. If you're looking to fly out anywhere, there is a Molift Smart Case available which you'll need to protect from damage. Molift Smart 150 Folding hoist is the easiest, lightest, usable hoist on the market. Lifts a max. of 24 Stone or 150Kg off the floor, goes through 75cm doors easily, weighs only 25Kg, separates into 2 pieces easily and comes with a battery and charger. The new Soft travel bag is an excellent accessory to discreetly transport your Molift Smart. There are storage compartments to store your battery and charger easily. This Spreader bar is for the Molift Air 200. Molift offers optional suspensions that fit new and existing hoists. The lightweight suspension bars come in many different user sizes and shapes. The bar is also easy for the caregiver to change or carry due to it's lightweight design. The three versions of the suspension bar are: 2-point, 4-point and 8-point. The 2 and 4-point versions also have three sizes: Small, Medium and Large. Molift Air 200 4 point spreader bar - SThis Spreader bar is for the Molift Air 200. Molift..
Molift Air 200 4 point spreader bar - LThis Spreader bar is for the Molift Air 200. Molift.. This Spreader Bar is for the Molift Air 200 Ceiling Hoist. Molift offers optional suspensions that fit new and existing hoists. The lightweight suspension bars come in many different user sizes and shapes. The bar is also easy for the caregiver to change or carry due to it's lightweight design. The three versions of the suspension bar are: 2-point, 4-point and 8-point. The 2 and 4-point versions also have three sizes: Small, Medium and Large. Molift Air 200 4-Point Spreader Bar - MediumThis Spreader Bar is for the Molift Air 200 Ce.. The Molift Air 200 is the newest member of the Molift Air family. The Molift Air 200 is smaller than its predecessors, but does not lack in functionality. The Molift Air 200 provides optimal comfort and safety in hoisting situations. With a SWL (Safe Working Load) of 205kg and a low total product weight, the Molift Air 200 offers a versatile hoisting solution. Just like the other Molift Air models, this Molift Air 200 can be used with Fixed Track ceiling solutions and free-standing Portable systems. The Molift Air 200 is also easy to install and transfer with its extra low weight and quick release system. With the provided 2-button handset, the ceiling hoist's lifting feature (Up/Down) can be controlled with ease. The Molift Air 200 can also be combined with a range of 2-point and 4-point spreader bars, available in different sizes to suit the patient. 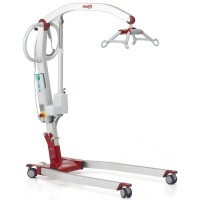 Molift Air 200 Ceiling HoistThe Molift Air 200 is the newest member of the Molift Air fami..
Molift Air 200 Ceiling Hoist The Molift Air 200 is the newest member of the Molift Air .. The soft handles are for use with the Molift Raiser and provide support for users who have difficulty reaching the handle. The soft handles can help the user reach all the way. The soft handles come in a pair (2). 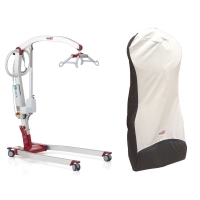 The soft handles are for use with the Molift Raiser and provide support for users who have..